An almost complete lack of housing for dominant culture staff supporting Yolngu owned initiatives, where the skills required are not available in the community. Hope for Health – already having proven success in revitalizing peoples health. Traditional Owners working in partnership with others to build unity and working relationships with the Lands Council to improve community control over leasing. 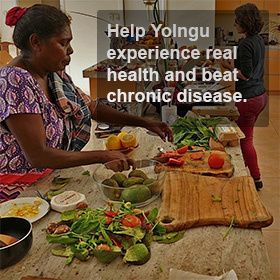 Yalu Marnggithinyaraw AC partnering with The Australian Red Cross to develop and demonstrate ways that locally envisaged and run social change projects can overcome bureaucratic processes to access and manage government funds. Re-establishment of the Galiwin’ku elders forum now called the Galiwin’ku Makarr Gärma forum, who meets to discuss local law and order, Indigenous rights, and social issues. Ongoing support is now provided through East Arnhem Mediation office. prevention of a treated sewage pipeline into local hunting grounds. We helped local Aboriginal land owners make the stakeholders aware that this plan was against their wishes and that they wanted a land base disposal plan that included the recycling of nutrients. The Stakeholders have now committed to an ongoing dialogue on the matter. logistical support and cross-cultural guidance for Indigenous groups seeking legal action as a result of poor consultation over land leases.